Most people have a checklist they go through before they leave the house. Is the stove turned off? Are the doors locked? Do I have my wallet, my keys and my cellphone? Today, 91% of Americans have cellphones and 61% of them have smartphones. This is a remarkable change from even a few years ago. If you haven’t started using our mobile banking app yet, here are some benefits for you to consider. One of the greatest benefits of mobile banking is being able to complete your banking on your lunch hour, vacation, or anytime you are on the go. Rather than waiting for your statement every month or booting up that slow PC to check your account balances online, you can view transactions while waiting for a bus or in line at a restaurant. Branches will still be around, but having a mobile app will allow you to handle most of your banking needs anywhere. 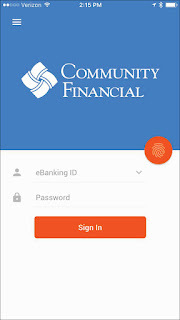 Mobile banking is secure and safe. Data transmitted from your cellphone to your provider is heavily encrypted. If you lose your phone, it can be remotely deactivated and passwords usually aren’t stored on the device. Security leaks have affected PCs, Macs and point of sale terminals, but no widespread security vulnerability has compromised mobile banking. Mobile Banking keeps you in control of your finances and can help keep you from making costly mistakes. If you know funds may be running tight, check your account balance while in the checkout line to make sure you can cover the cost of your purchases. You can also set up recurring bill payments, so that you never miss paying a bill or incur late charges. By regularly checking your account statement, you can catch things like accidental overpayment or other errors before they turn into big issues. The Community Financial mobile banking app recently had some upgrades. It now has a fresh new look and upgraded navigation features like touch id and swipe functions. If you currently have our app, don’t forget to run the update on your phone. Mobile banking won’t replace traditional, face-to-face interaction. There will always be a place in the credit union service standards for the human interaction. What mobile banking apps offer is a wonderful supplement to those high-quality services. Convenience, security, and peace of mind are all available from your pocket, anywhere in the world.